I know we’ve all had a bad day at work, so here’s a little quickie to ward off those bad days. I made these a few years ago, for my co-workers and to sell at a local craft fair. 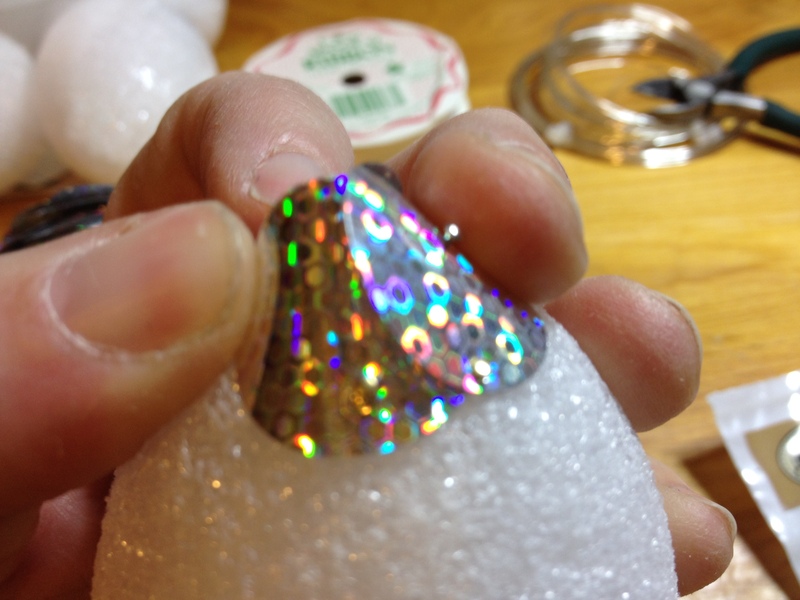 Next thing you know, I started getting bulk orders for custom colors and quantities. Once you get the hang of it, they go together quickly. 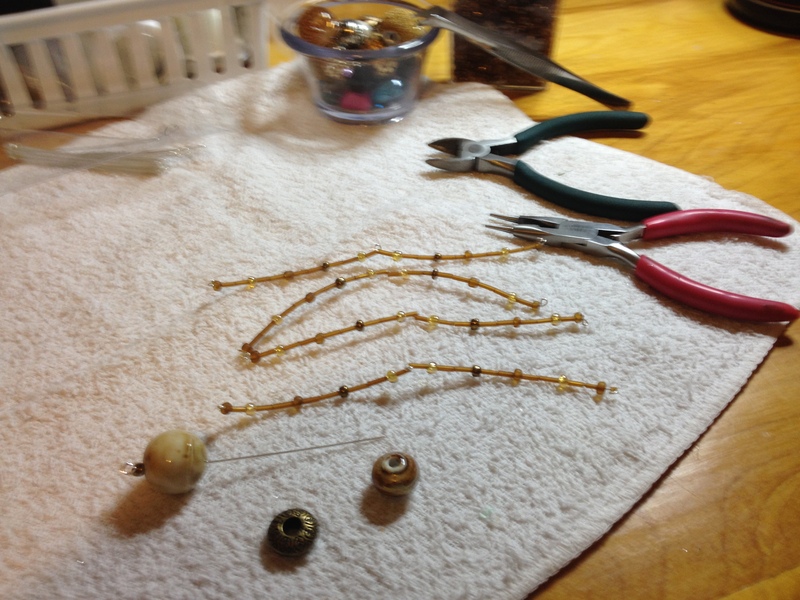 I purchased both pearl beads and wooden beads for the heads. 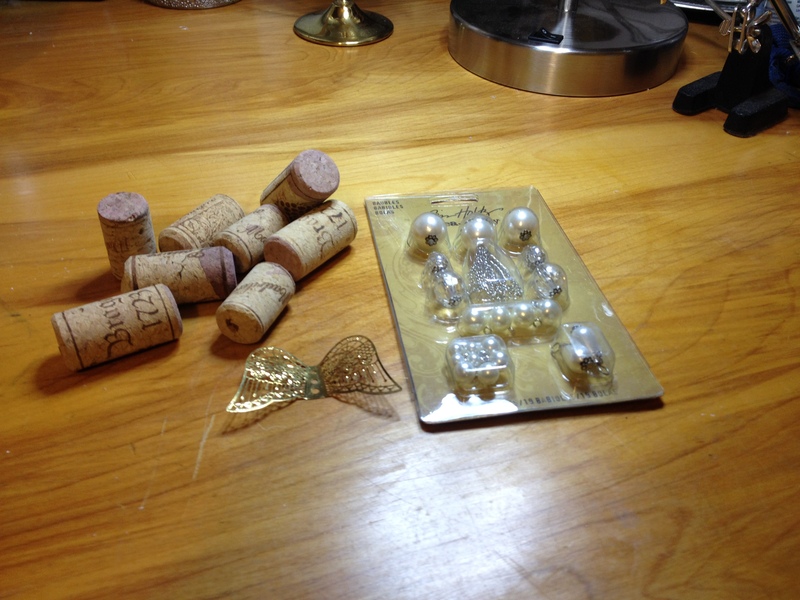 It seemed to me that the pearl and silver ones looked “city”, and the wooden heads more “country”. 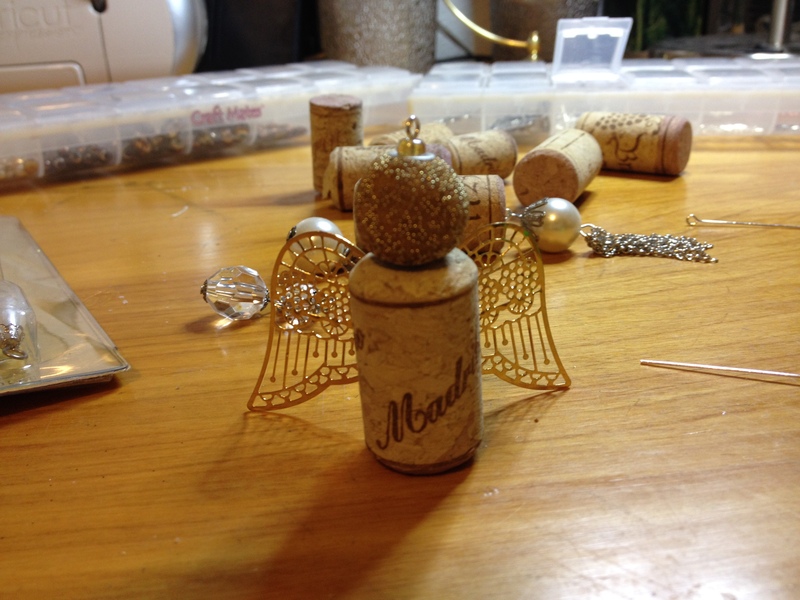 Make sure the jump rings are a size smaller than the head bead, you wouldn’t want her halo falling off, or slipping down. 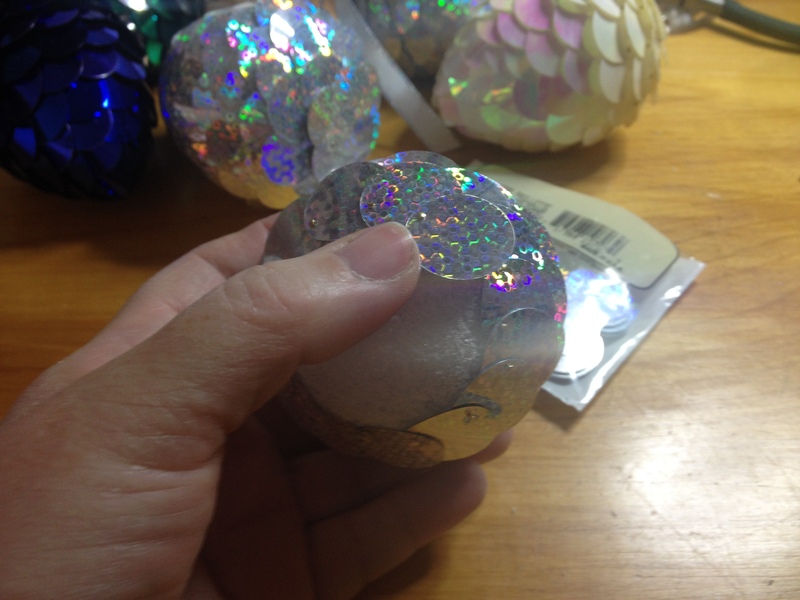 I started by cutting several lengths of ribbon into 12″ pieces. 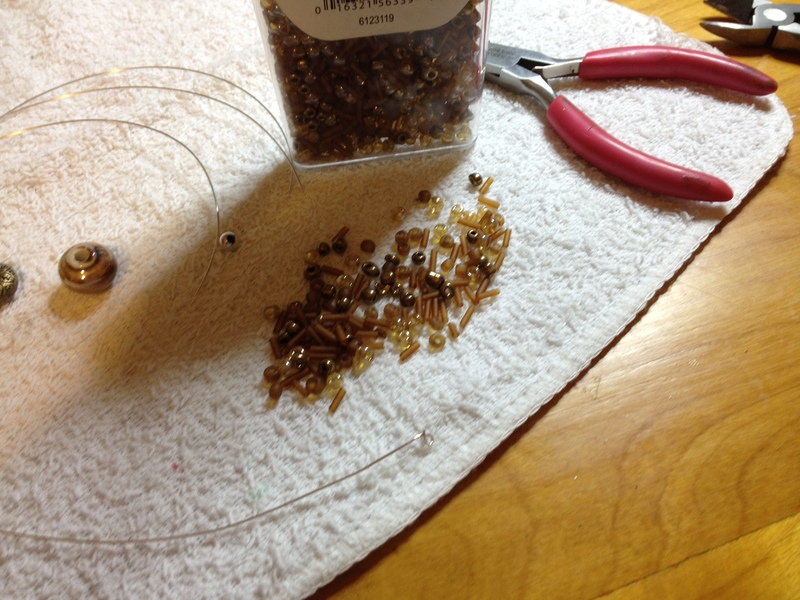 Next, separating the flowers and leafs from the stems. I set up bowls of each item and worked on these assembly line style. 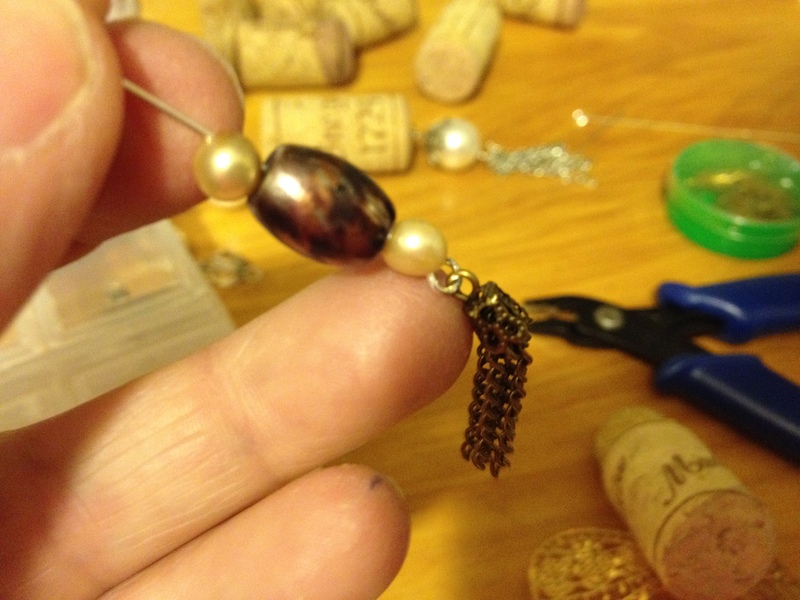 Start by threading a head bead onto the ribbon. 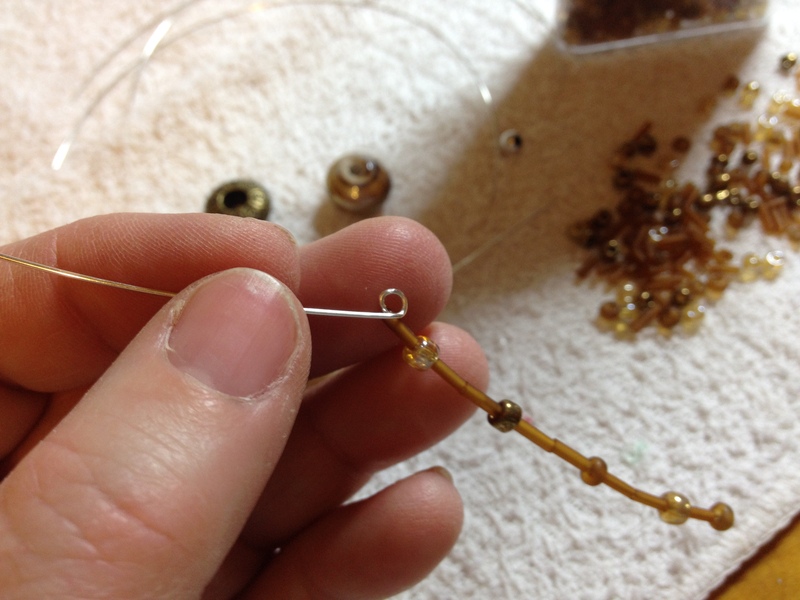 Leave a hanging loop 1-1/2″ long, and go back through the bead again. 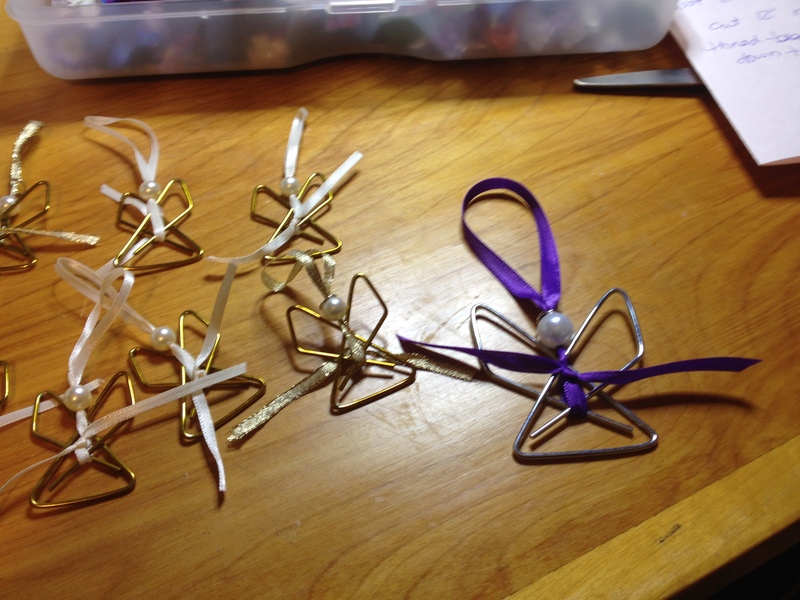 Tie the ribbon around the middle of the clamp and cut ends on a diagonal. Slip the jump ring for the halo, over the hanging loop. 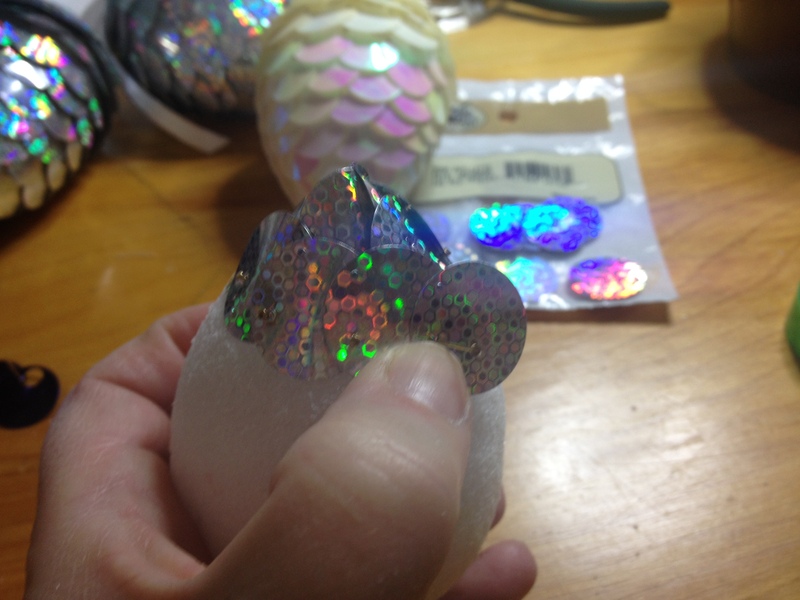 A little dab of glue will hold it, but I kinda like it to move around a little bit. 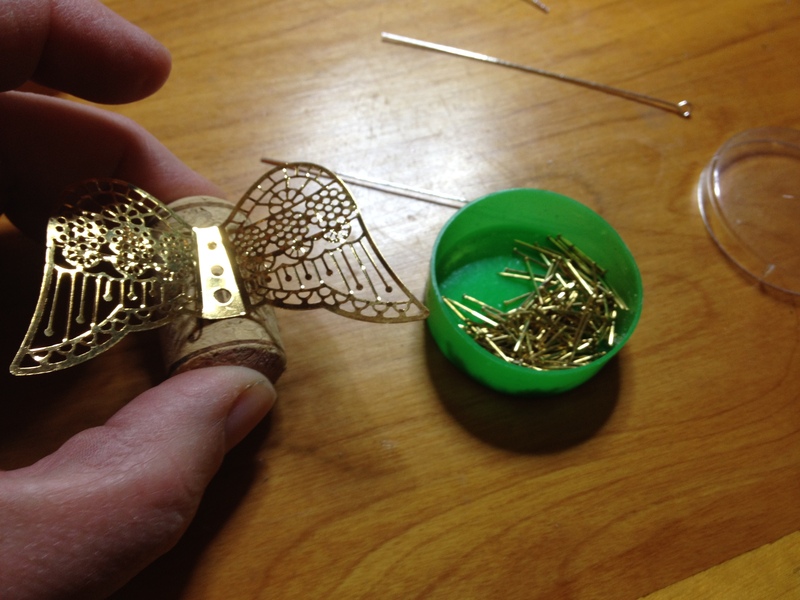 Now all that’s left is to embellish her “dress”. I put a leaf as a base, then add some tiny flowers. 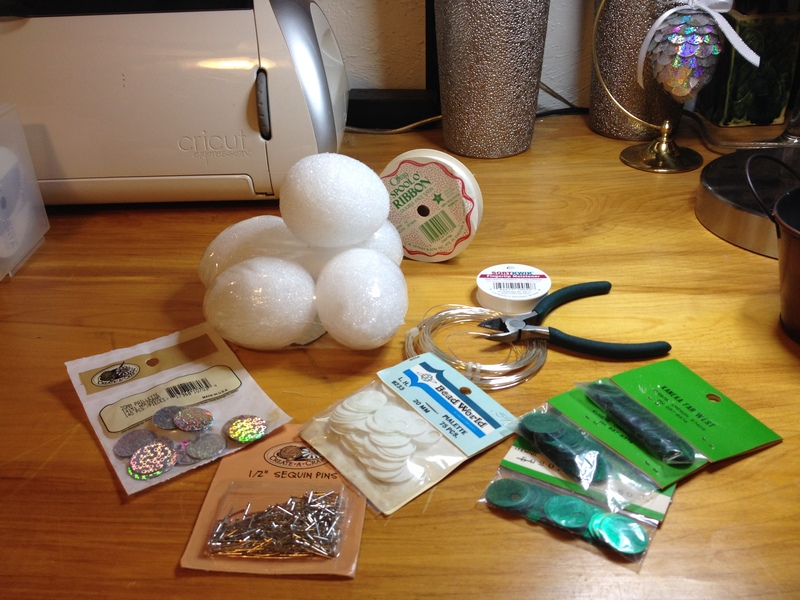 You can add them with the hot glue gun, or quick drying glue. If I’m feeling extra fancy, I add a charm. 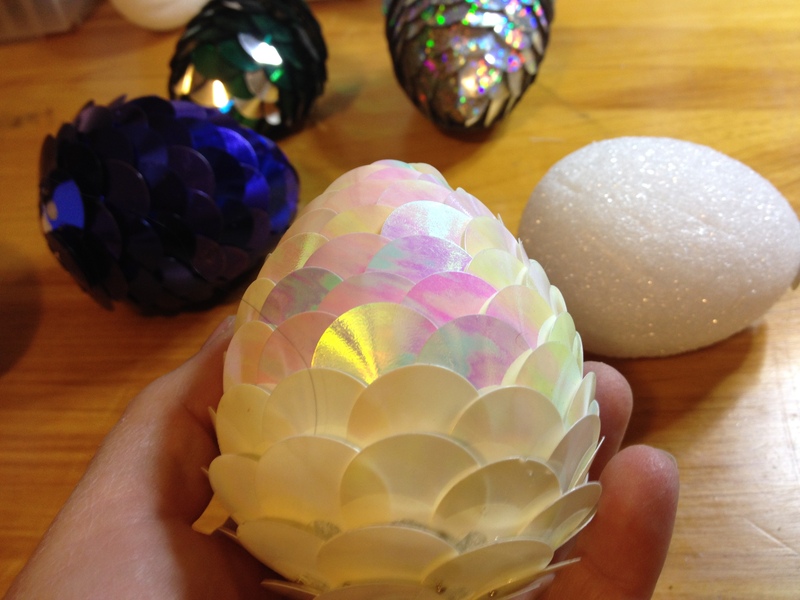 You can do them in pinks and blues, they were quite popular for baby’s first Christmas Ornaments. 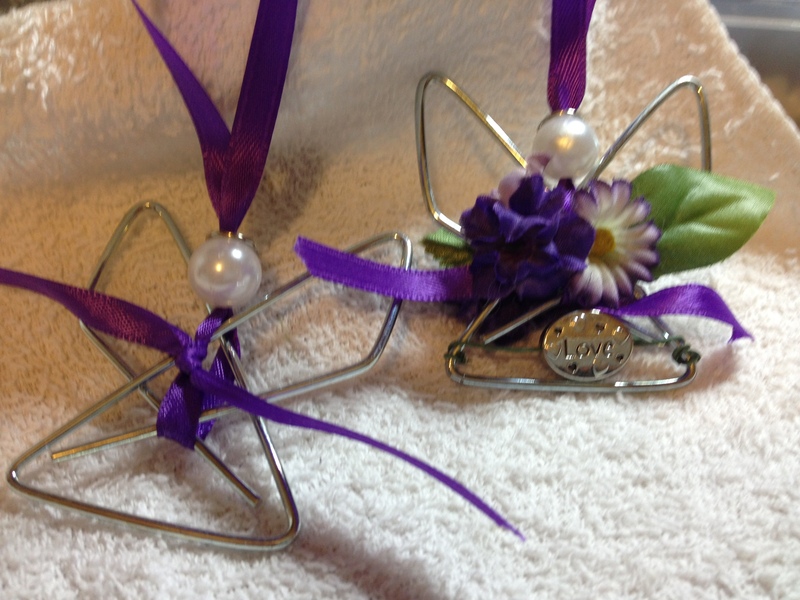 Sports team colors, School colors, holiday flowers and my favorite purple and white!! 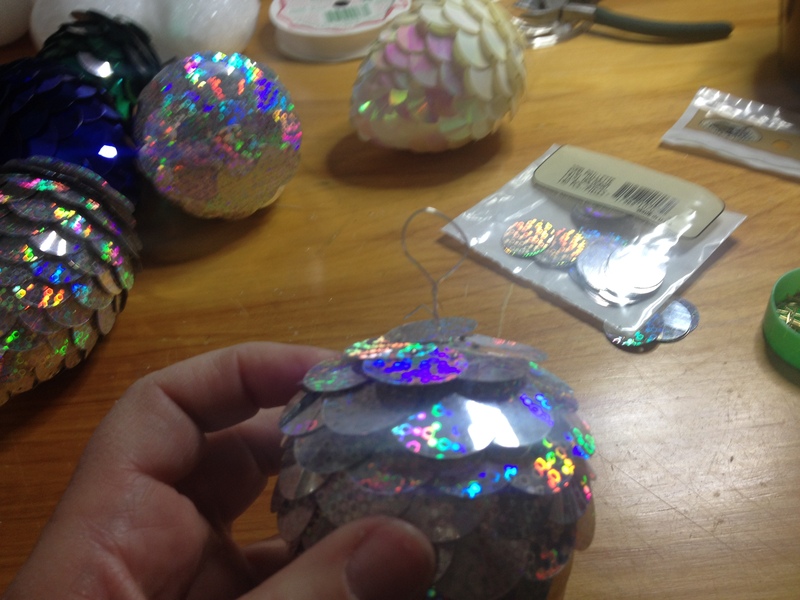 Be sure to embellish both sides of the dress, she’ll spin when hanging. I hope these bring you joy, and end all those pesky bad days at work. 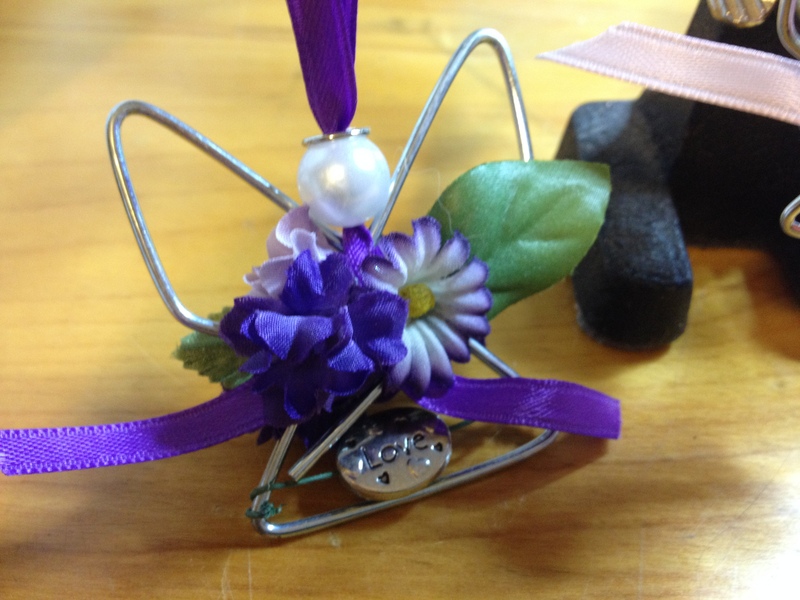 A quick and easy craft, that is pretty and thoughtful. I found this idea on the net last year. 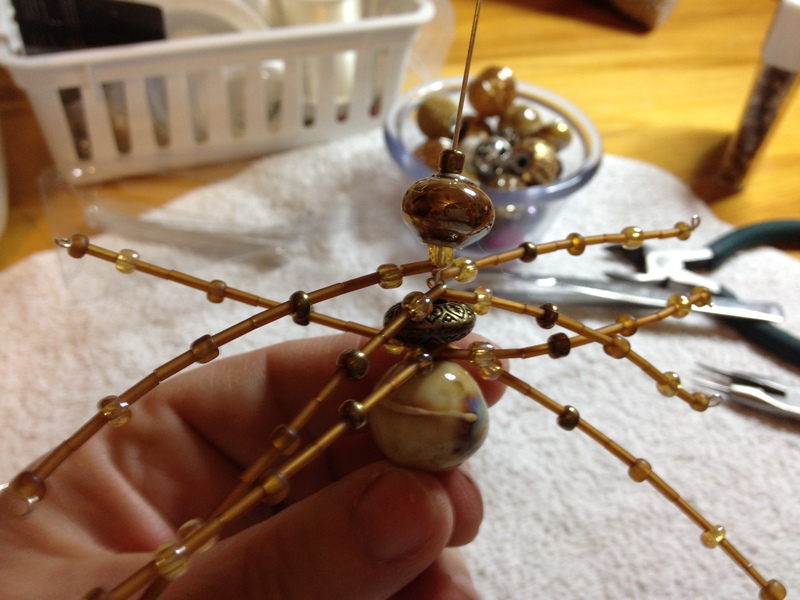 I thought it was such a cute story, and I had dozens of ideas for sparkly spiders. 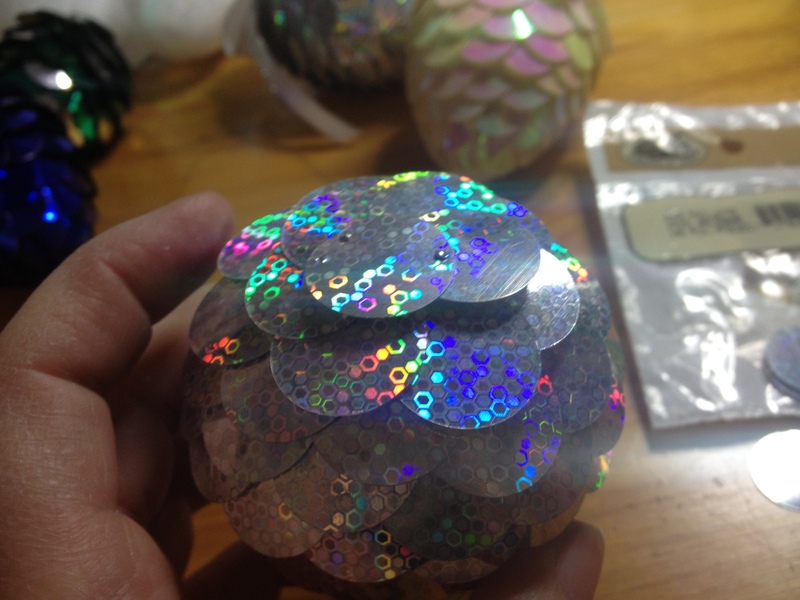 I decided to make it this years Christmas craft. (I do something every year for co-workers and friends). There are two basic parts to this project. 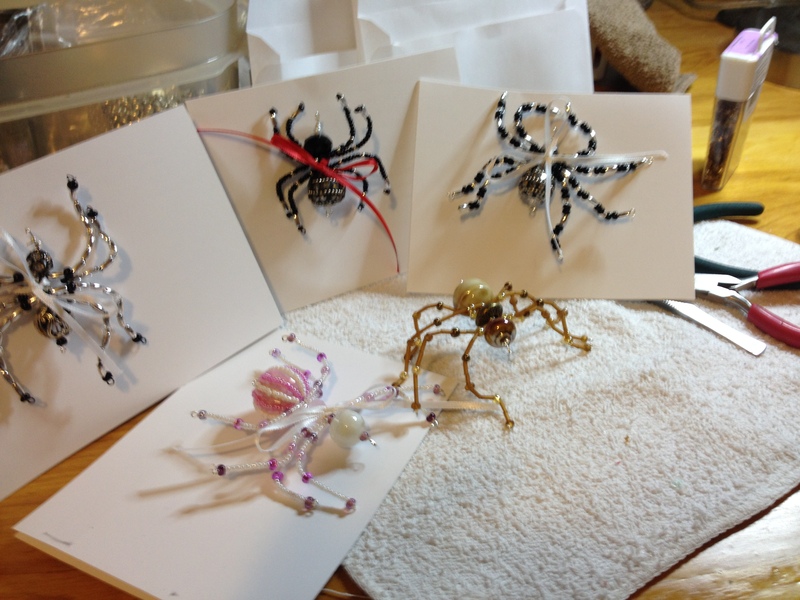 The spiders, and the presentation cards. 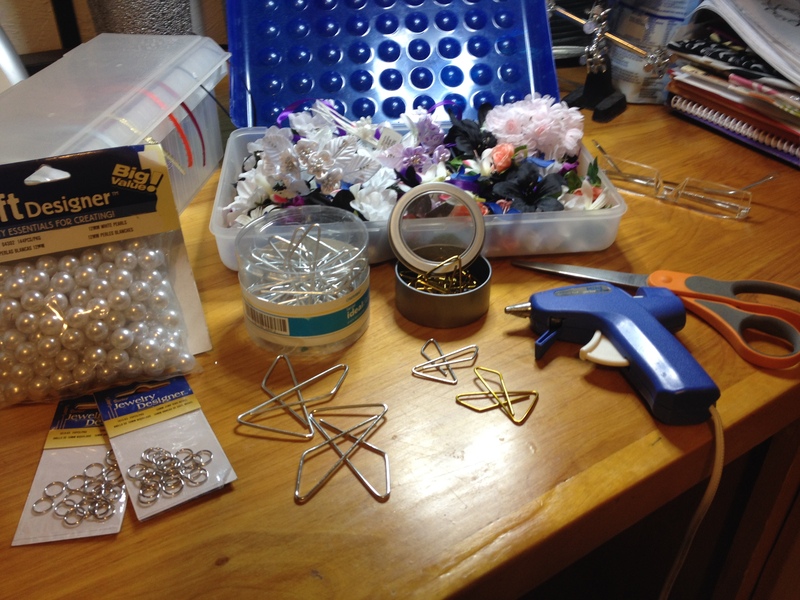 First, let’s make some sparkly, pretty spiders. Size is your choice, I wanted them to fit my cards, but you can do bigger or smaller to suit your taste. The sizes listed are what worked best to fit on the standard card stock I printed the story on. 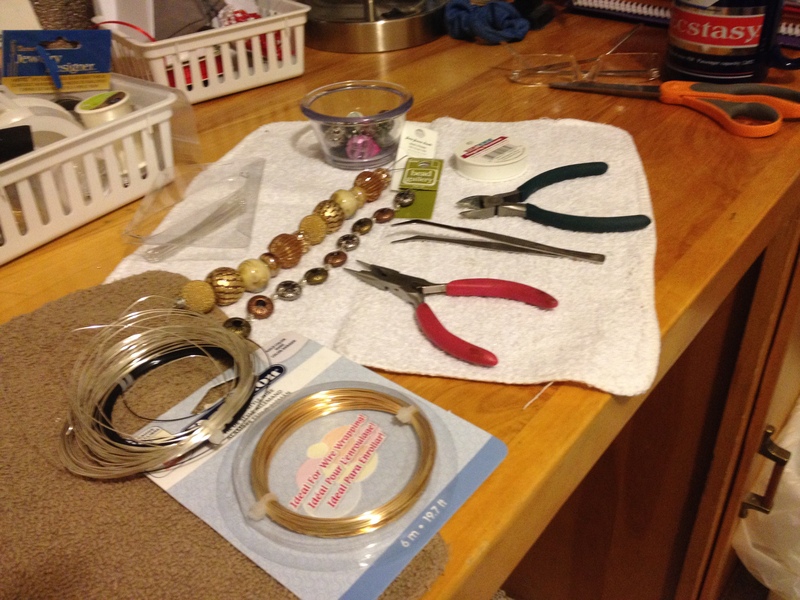 I found some beautiful beads at the craft store, but you can find amazing ones online or in your unused jewelry box. 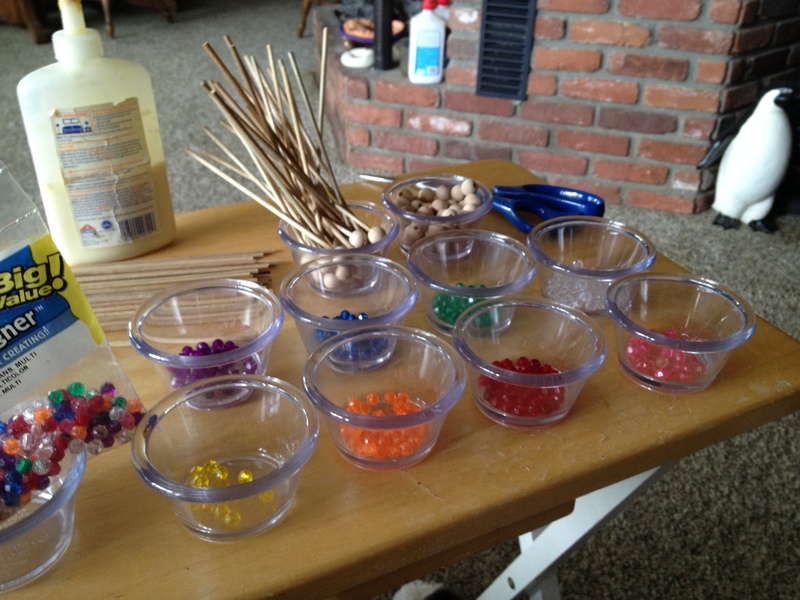 I like the mixed bead boxes for this project. 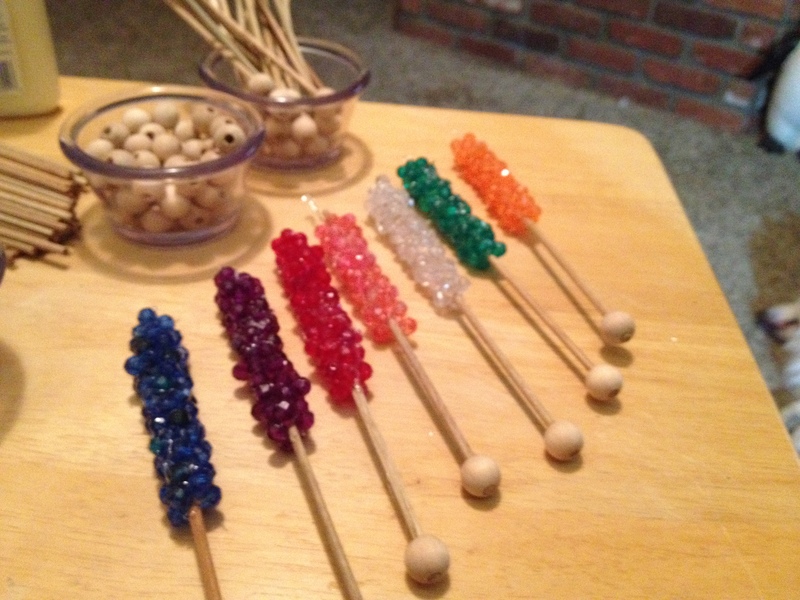 The assortment of beads and colors can do hundreds of combinations for the legs. 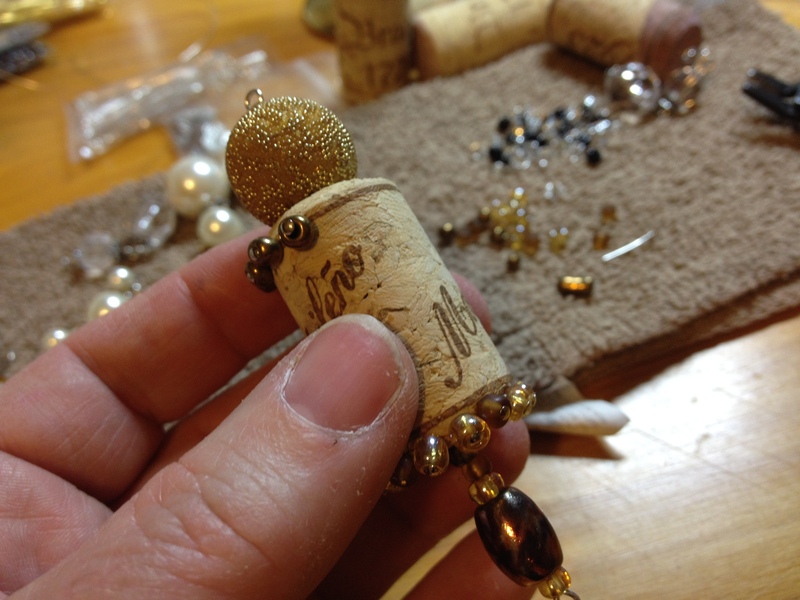 It is also a good way to use up leftover beads. 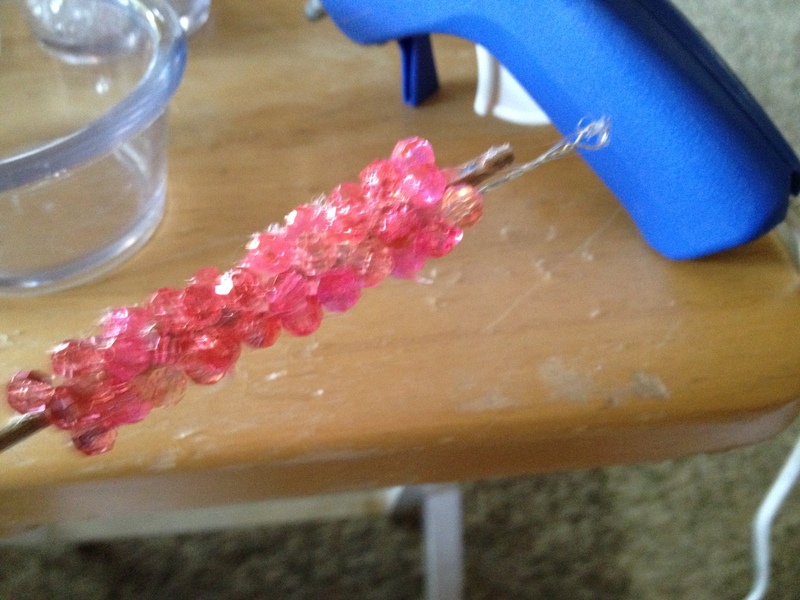 *tip: I work with a wash cloth nder my beads, it keeps them from rolling around, and fingertip moistener makes them easier to grab. 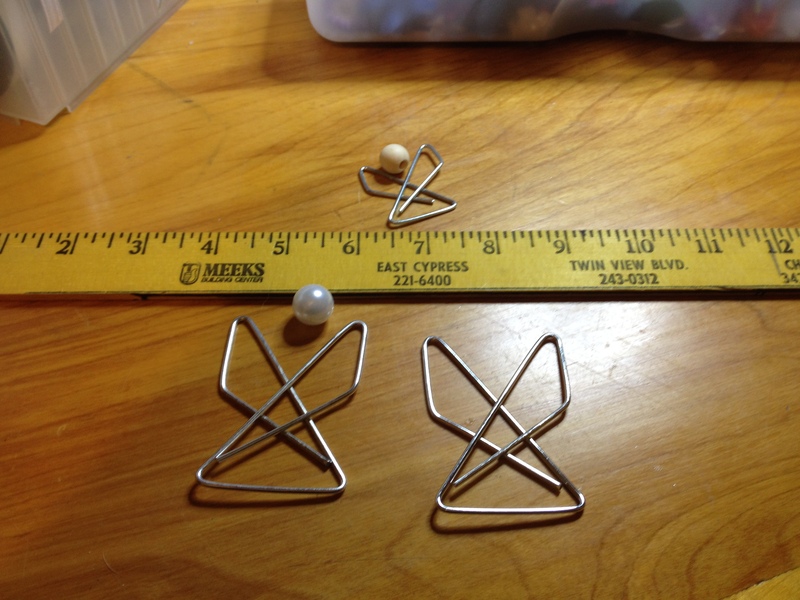 Start with 4 pieces of beading wire 6 inches long. These will be the legs. 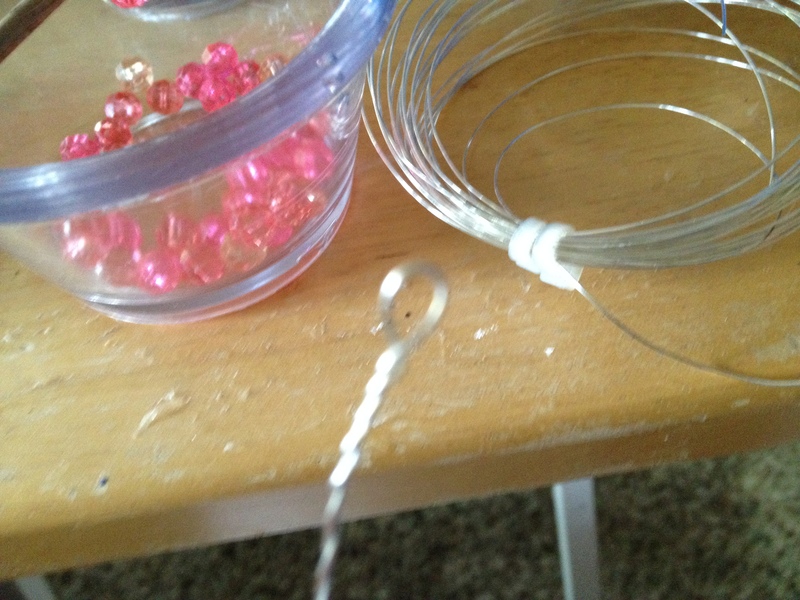 Bend a small circle at the end, put beads on until you have 2 1/2″ filled, bend a loop in wire, this will be the center loop. 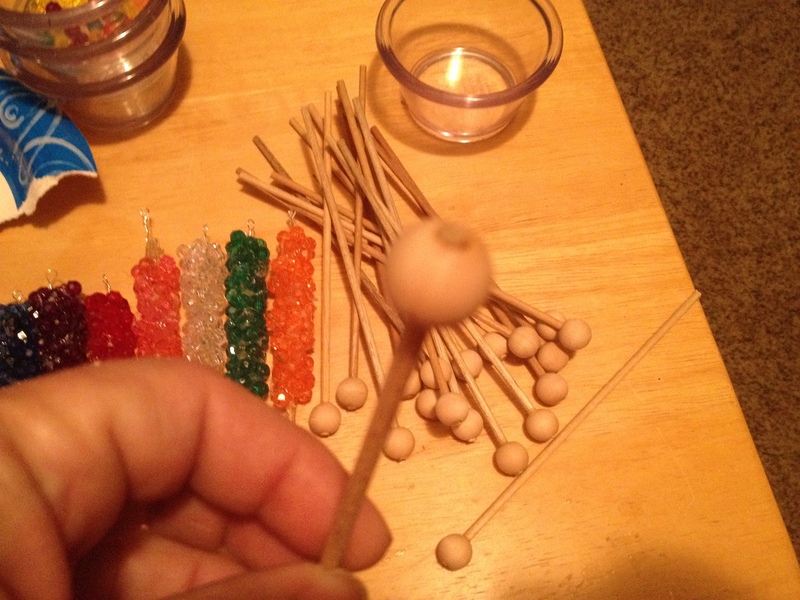 Bead the reverse of what you did, to do the other leg and end with another circle. Do four of these, repeating the same pattern for each leg. Bend the legs into a pleasing shape. 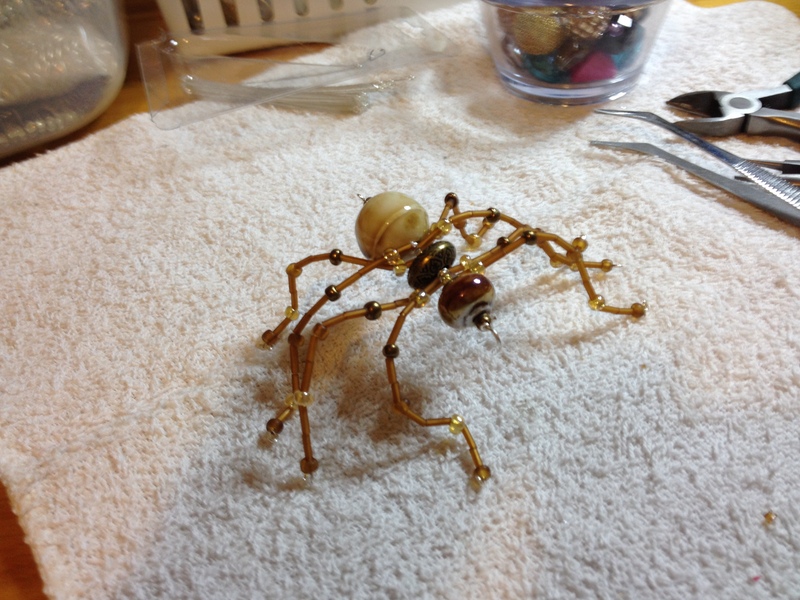 I pulled the front legs above the head, next set facing forward. The back legs supporting the bottom, and slightly pulled back. To make the cards, you’ll need card stock, a computer and printer. 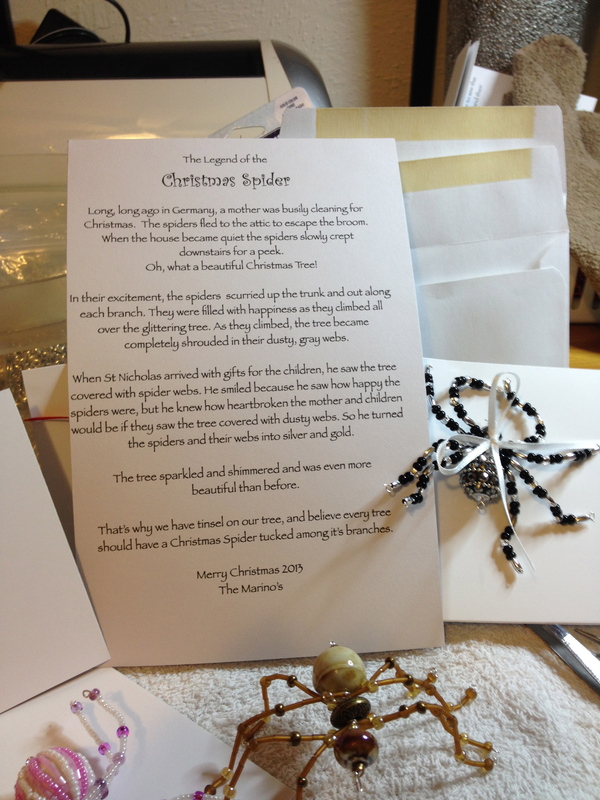 I think the story is important for explaining why you need a spider in your Christmas tree. 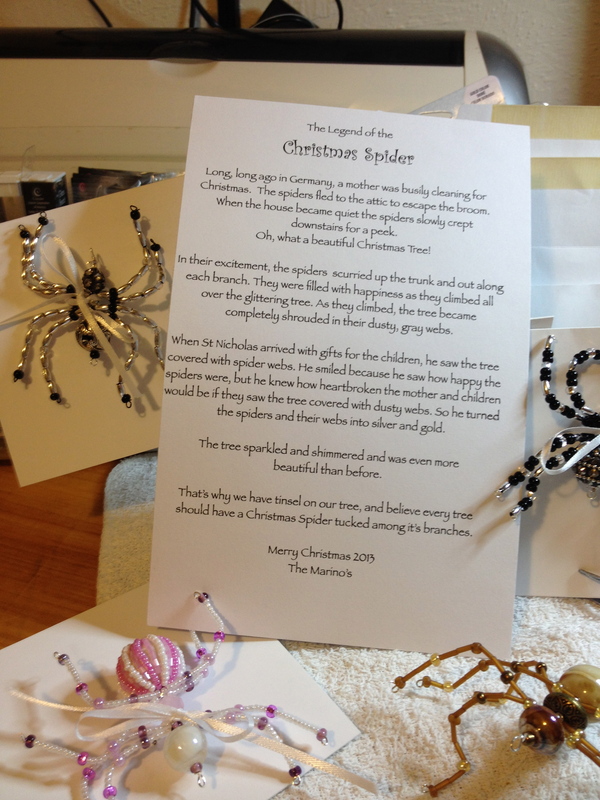 By printing the story inside, and attaching the spider outside, it made a nice presentation. so the spiders fled to the attic to escape the broom. the spiders slowly crept downstairs for a peek. 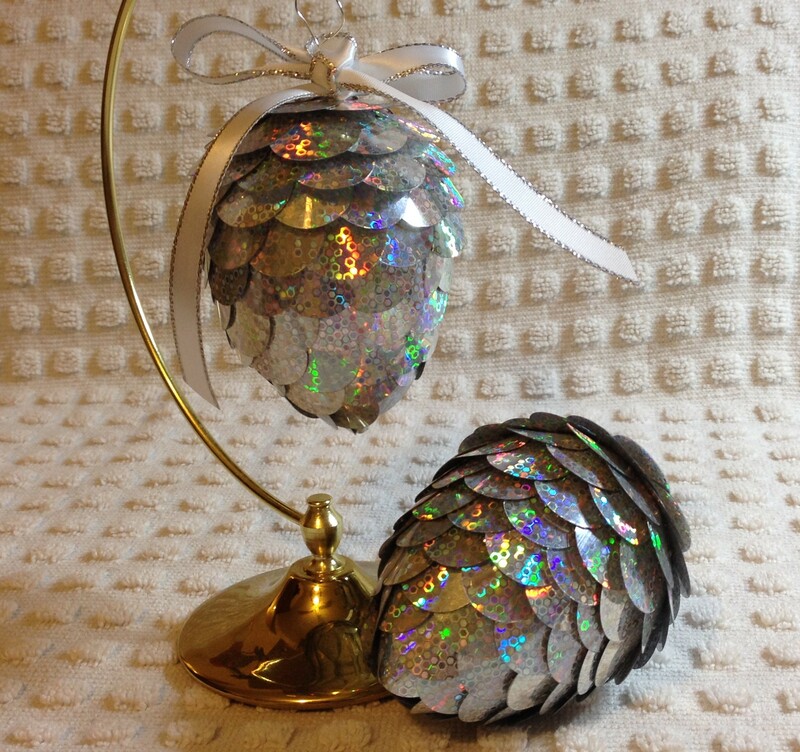 Oh, what a beautiful Christmas Tree! completely covered in their dusty gray webs. he saw that the tree was covered with spider webs. but he knew how heartbroken they would be to see the tree covered in webs. So he turned the spiders and their webs into silver and gold. Christmas spider tucked among its branches. I printed this on the inside of plain white card stock. I left a space in the upper part of the story to punch a couple of holes, that I threaded 1/8″ ribbon through and tied a bow around the spider to attach to the card. You can modify the story, font and spacing to fit your particular project idea. You could also print it on plain paper. Everyone loved the story, and even my Bestie, who is terrified of spiders, loved hers too. 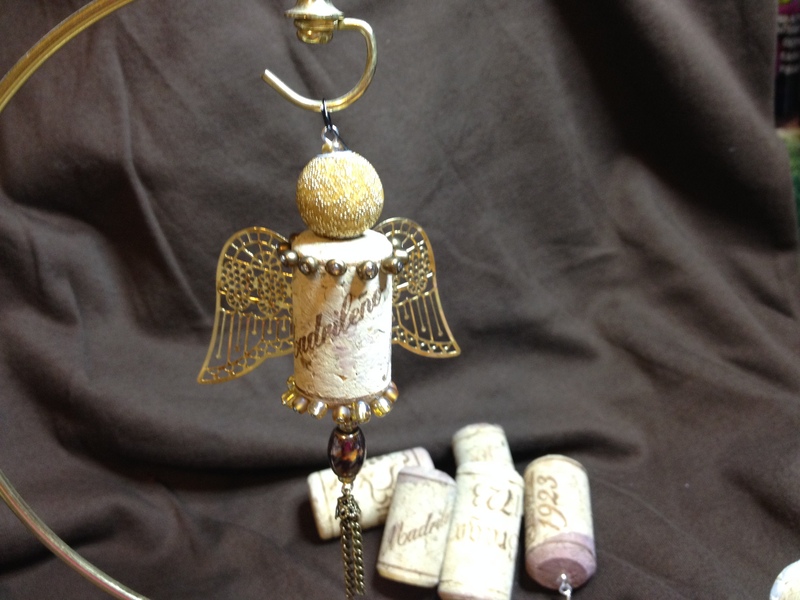 A couple of friends told me they hung them from their rear view mirrors, because they were so pretty!